For more than seven decades the conflict between Israel and the Palestinian people has raged on with no end in sight, and for much of that time, the United States has been involved as a mediator in the conflict. 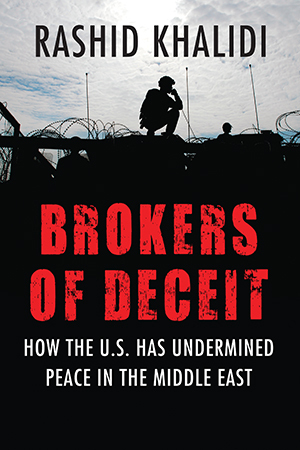 In this book,acclaimed historian Rashid Khalidi zeroes in on the United States’ role as the purported impartial broker in this failed peace process. Through in-depth research into and keen analysis of these three moments, as well as his own firsthand experience as an advisor to the Palestinian delegation at the 1991 pre–Oslo negotiations in Washington, DC, Khalidi reveals how the United States and Israel have actively colluded to prevent a Palestinian state and resolve the situation in Israel’s favor. Brokers of Deceit bares the truth about why peace in the Middle East has been impossible to achieve: for decades, US policymakers have masqueraded as unbiased agents working to bring the two sides together, when they have, in fact, been the agents of continuing injustice, effectively preventing the difficult but essential steps needed to achieve peace in the region. Khalidi is quoted at length in "A Gaza Stripped Anew," in Outlook India.